As I Love Transit Week winds down, I want to follow up on my essay from the beginning of the week (also cross-posted here). As I mentioned before, the Buzzer Blog, its outside contributors (and I now count myself among that group), and those who comment on its posts have proven that I’m not alone in my enthusiasm for public transit. Reading (and viewing and listening to) other contributions to this week’s series of posts, as well as seeing the turnout at Thursday night’s I Love Transit meetup, only reinforced that further. The fact that there were a number of children there, putting together bus and SkyTrain cutouts, and participating in all the activities, shows that there will be a next generation of transit enthusiasts. A big, BIG shout of thanks and congratulations to Jhenifer, the Buzzer blogger, who launched the concept last year and bringing it back bigger and better, as well as organizing the meetup. In her introductory post to this week, even the biggest transit geek can get frustrated with late buses (raising my hand here), but the overall benefits of taking public transport (regardless of the reason) well outweigh its shortcomings. 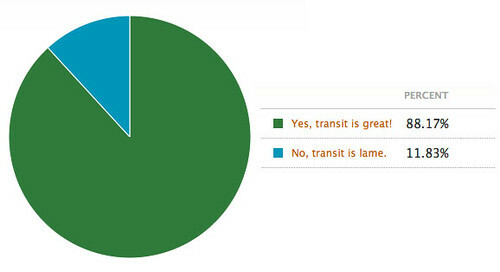 The above chart is the result of a poll on LA Metro’s blog, The Source. Los Angeles just held its own I Love Transit Week, citing the Buzzer Blog as inspiration and coinciding with the 20th anniversary of the opening of its Blue Line rail service. This just might be a good thing, and that’s where my wish comes in. Let’s make I Love Transit a worldwide event. Be it a day or a week, it’s about time this should happen. Spread the word to the person sitting next to you on the bus/tram/train/streetcar; let your local agency know what’s been happening in Vancouver and Los Angeles. Hopefully, there will be more cities celebrating this next year! Wow Eric — thanks for the shout out! And I’m in agreement. Let’s get I Love Transit to spread even further next year!